On a steamy summer afternoon, a team of seven volunteers from American Pool’s corporate office took to the streets as part of a shared commitment to #FirstServeOthers. Together, the team collected 13 bags of trash consisting largely of plastic bottles, fast food waste and cigarette butts. The effort was hampered by Mother Nature, thanks to a heat index of more than 100 degrees and unseasonably high humidity making working conditions difficult. By the time the team was finished cleaning two miles of roadway, each was soaked to the skin but energized by a successful day of giving back. 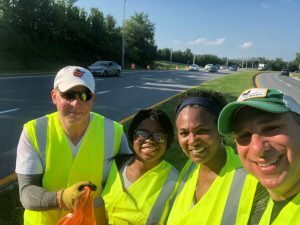 American Pool Enterprises chose Adopt-A-Highway because the team cares deeply about the environment around them and the program is scalable, allowing numerous volunteers to come together at one time. In addition to the community service aspect, there are also teambuilding benefits as well. American Pool has committed to four highway clean up days a year — doing its part to keep roadways clean and free of waste. From left Rick Naden, Anaya Oderinde, Marieda Oderinde and Kasey Simon. Not pictured, Sean Campbell, Brooks Wunder, and Scott Small.